This Rubber Belt Unit contains standard heavy 38 mm (1-1/2”) thick steel plate side frames and 76 mm (3”) sch. 40 pipe tie members. The main 610 mm (24”) diameter stainless steel cylinder x 84” wide is suitable for 9.14 kg/cm² (125 PSI) maximum working steam pressure in accordance with The American Society of Mechanical Engineers Pressure Vessel Code and will be complete with a high pressure sealed rotary joint. For HEAVY DUTY, this 610 mm (24”) diameter Drum is fitted with larger diameter journals and #22319-CK bearings with tapered sleeves. National Board # 32283, Ser. # T- 32567. At the entering end of the unit is a 254 mm (10”) diameter heavy chrome plated pressure roll for squeezing the rubber belt against the 610 mm (24”) diameter main drum. Roll is complete with manually operated adjustable screw jacks arranged for applying pressure evenly across the face of the cylinder. For HEAVY DUTY, this pressure roll has a larger diameter through-shaft and #22317-C bearings mounted in pressure roll arms. We will provide a fixed stainless steel scroll bar at entry to rubber belt. A steam-heated stainless steel nip guard is provided as a safety measure. 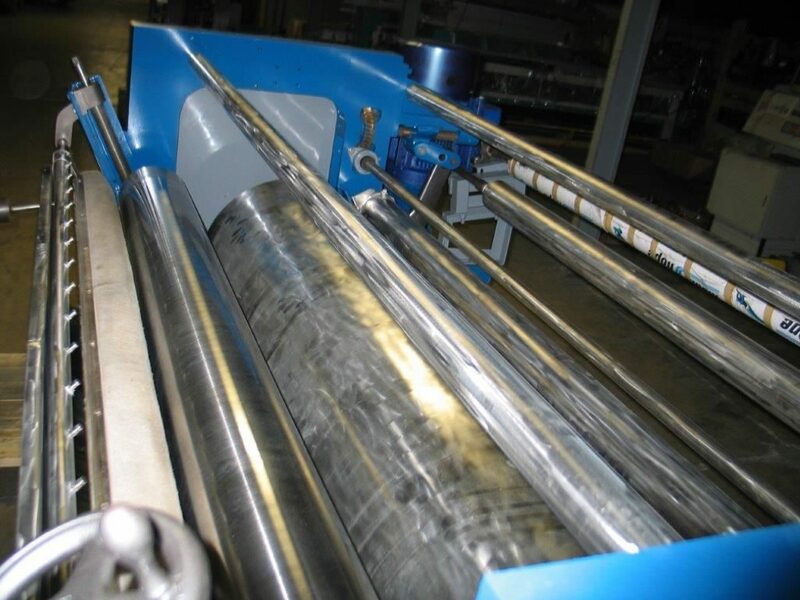 Two (2) additional 222 mm (8 34”)diameter stainless steel rolls are supplied; one directly below the steam cylinder as an idle roll, the other as a manually operated belt tightener roll at the delivery end of the unit. The roll adjustment is accomplished utilizing a screw jack (one per side) with a handwheel. Each side is adjusted independently and is equipped with a scale to indicate blanket stretch. Ball bearings in these rolls will be protected from water penetration both by seals and slinger ring caps. Four (4) stainless steel water spray pipes supplied for cooling both the inside and outside surfaces of the rubber belt. There is an air-operated, 127 mm (5”) diameter, stainless steel dual wiper roll arrangement to remove excess water from the rubber belt prior to contact with the cloth, as well as a counter-weighted full-width wiper blade with replaceable felt strip for wiping the outside surface of rubber belt following the tension roll. One (1) bow roll, 90” wide x 4” diameter.